…buy a liter of vodka. Wait, is that not how the saying goes? I guess I should start at the beginning. We made it to Croatia! This is a feat to be celebrated, as we took a ferry across the Adriatic. The walls were so thin that when our neighboring cabin turned on their lights, our room had a nice ambient glow as well. In the end, the ship stayed afloat and we landed at Zadar. The most exciting thing we did in Zadar was visit the sea organ. The sea organ is basically a musical instrument that crafts sounds based on the way the waves pump air into its pipes. It’s a massive concrete structure with holes drilled into it, each set to different notes. As the tides and waves change, the air blows through in different ways and creates a variety of sounds. It’s one of those things you have to see to believe. I sat and believed for quite some time, as can be evidenced by my sunburn. We spent four lovely days at our apartment in Bibinje (Ba-bin-ya), which is just south of Zadar. Bibinje was a quiet village, but very laid-back and hospitable. I’ve never met such a welcoming group of people. Our landlady was kind enough to make us two different types of cake: one chocolate banana cream, and one cherry cheese. If there’s a way into my skeptical heart, it’s probably cake. In fact, her cake is the reason we’ll be leaving such a high review of her apartment. The apartment itself was a bit lacking. To start, I chose that particular place because it boasted laundry facilities. “Facilities” simply met that she had a line strung in the front lawn, and a tub for hand washing our clothes. This really wasn’t much of a problem, since we’ve been hand washing our clothes for the last few weeks. Oh the things I would do for a full size washer and dryer!! The real downside was that the place didn’t offer air conditioning. As I’ve mentioned before, this isn’t that uncommon. However, there wasn’t even a fan. We spent four fairly miserable, sticky nights with the windows open. Opening the windows meant we invited in a variety of critters, from bugs to lizards, and we also got to experience the sounds of the Croatian nightlife. I learned that a cat fight and a chorus of barking dogs sound the same in every country, and that midnight is the best time to use a table saw. That being said, Croatia is my new favorite country. It is the most beautiful place I’ve ever visited, as well as being the most friendly. Everyone is willing to lend a hand, whether it be directions to the beach or the best way to get from one island to another. We’re currently staying in an awesome apartment on the Croatian island of Brac. 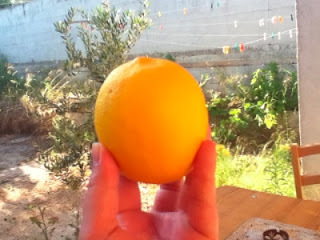 It has lemon, orange, and olive trees growing right outside our door. Our landlord said he only grows them so his guests can enjoy them, and we have definitely obliged his request. I’ve never seen a lemon tree, let alone picked fresh lemons with my own hands. They are amazing! They’re sun ripened and warm, and they have this incredibly sweet yet tangy scent. I picked that with my bare hands! The first time my adventure partner set one in my palm, I thought “vodka tonic,” and we walked straight to the corner store. I don’t want to say too readily that I’ve found heaven, but if it exists on earth, it might just be in Croatia.